Winter has arrived in Edmonton, kicked off it’s boots and settled down in the rocking chair for a nice long visit. At it’s first arrival I was dismayed. “I wasn’t expecting you for another month!” I exclaimed. Winter may have spared me a scornful glance before getting back to the serious business of disrupting my late season cycling plans. I admit it was a naive thought based on Winter’s late arrival last year. On my late October birthday last year I went on my first 100km bike ride and in 2012 I had planned to do a 100 mile ride. The weather was not permitting. Shortly before my birthday. Too cold for a long ride with snow forecast for the day itself. 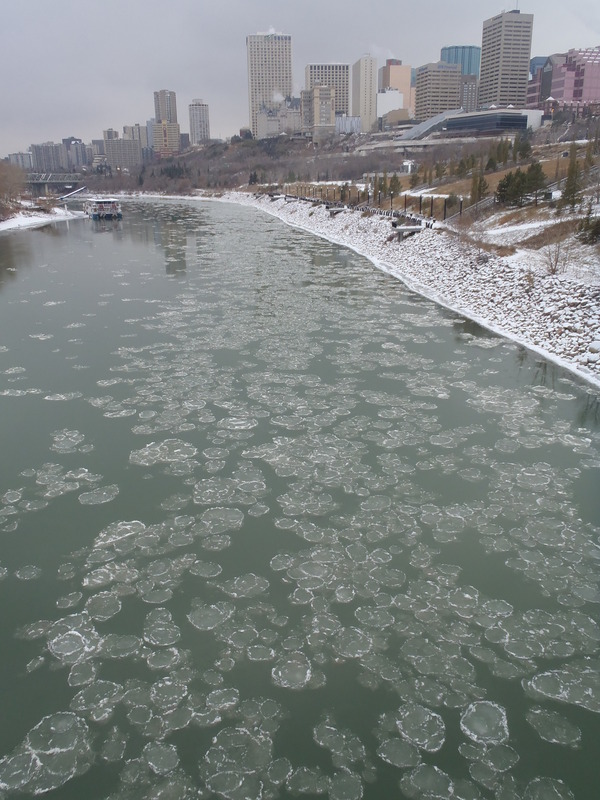 The ice pans forming in the river. They aren’t very substantial yet. This will change. In the week leading up to Halloween the temperature remained sub-zero, with periodic light snowfalls. Halloween itself was the usual frigid Edmonton affair with the children dressed in costumes optimized for warmth when trick-or-treating in the blowing snow. On November 1st the first real blast of winter arrived. 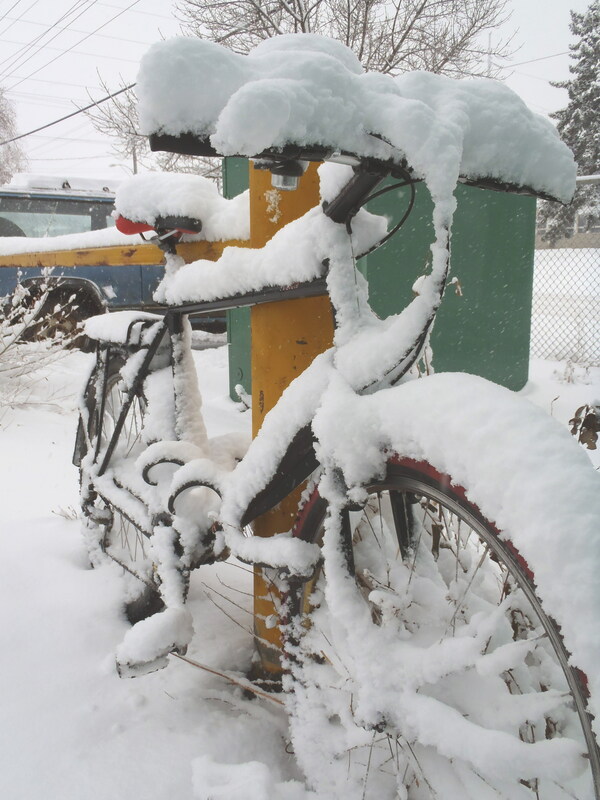 A good sized fall of snow came down during the workday ensuring a good workout on the pedal home. 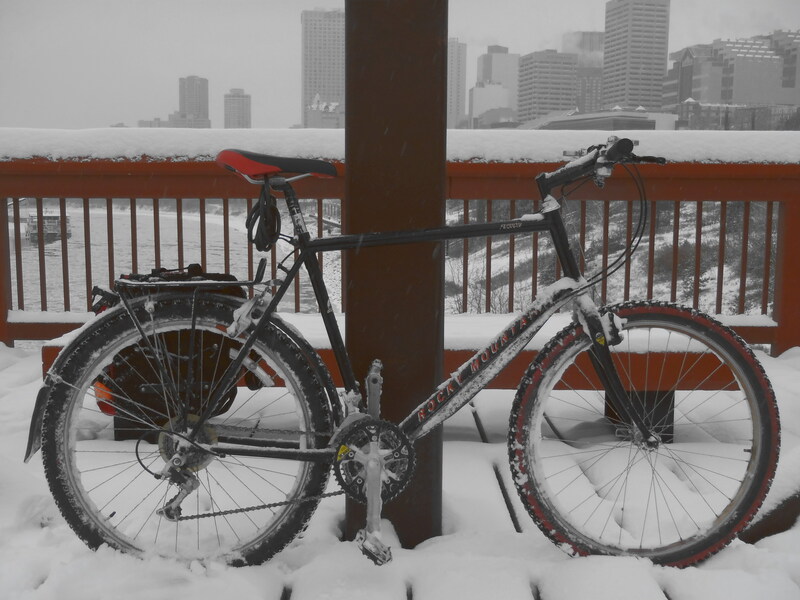 At this point I was still not mentally prepared for the onset of winter cycling. The new bike handled the conditions well while I did rather less well. 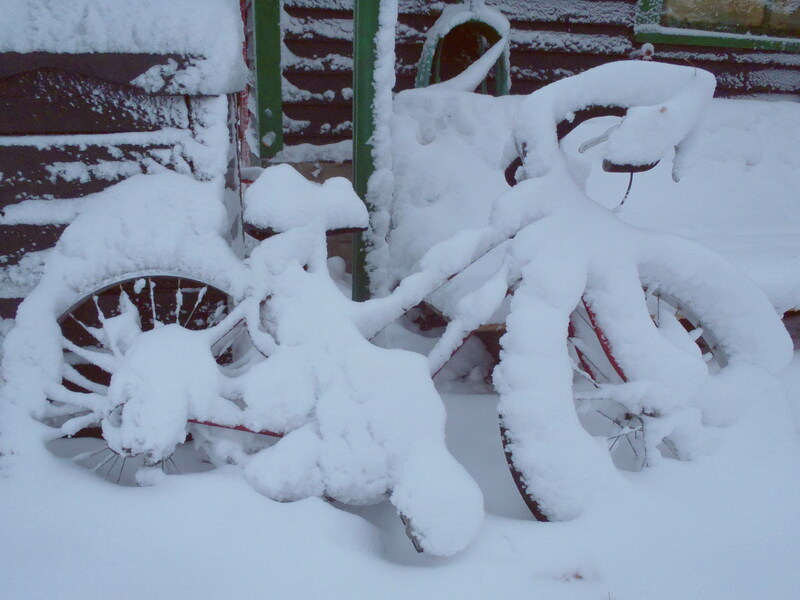 I always manage to blot out the memory of how much effort it takes to churn a bike through a fresh fall of snow. I was feeling disheartened at the thought of the long winter stretching ahead. I struggled homeward, arriving soaked in sweat. Once home I had no time to eat and barely time to prepare a thermos full of tea before I had to rush out the door to my volunteer shift at Bikeworks North. I toiled off to the shop feeling still more oppressed by the weather. The time at the shop in the good company of the other volunteers buoyed my spirits temporarily as we swapped stories of the day’s riding. Afterwards, however, I had to ride to the grocery store to pick up supplies. By this time, my body was screaming for refueling and I could feel my remaining energy draining rapidly. Once home again I was confronted with the sight of my still unshoveled sidewalk. During the day’s riding I had been often forced to take to the sidewalks and had blessed the people who had been prompt in clearing the way on their property. Duty compelled me to shovel the walk immediately. I knew I would not have the willpower to go outside again if I entered the house. That chore consumed my final few available calories. Once inside I was required to get our erratic dishwasher running again. Then I sat down. Exhaustion was now total. On the way home after the first real snowfall. 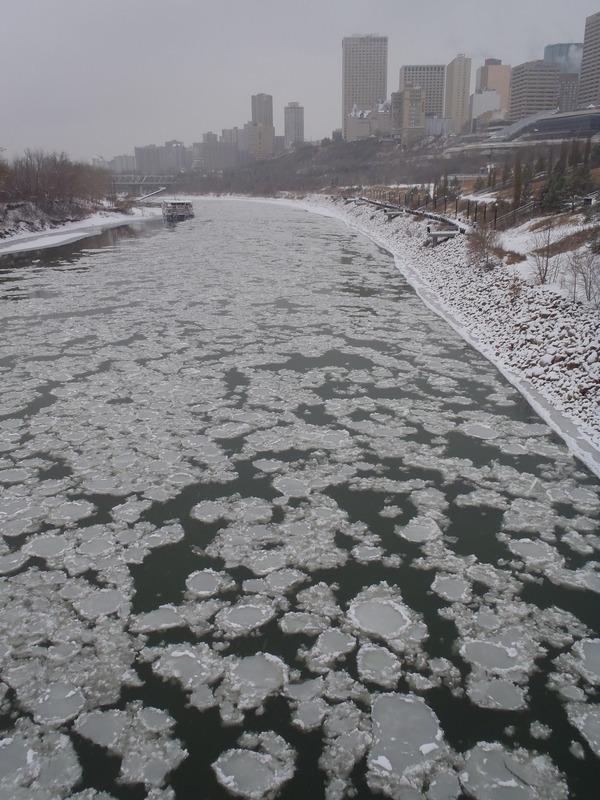 The ice was now filling more of the river and was more substantial. 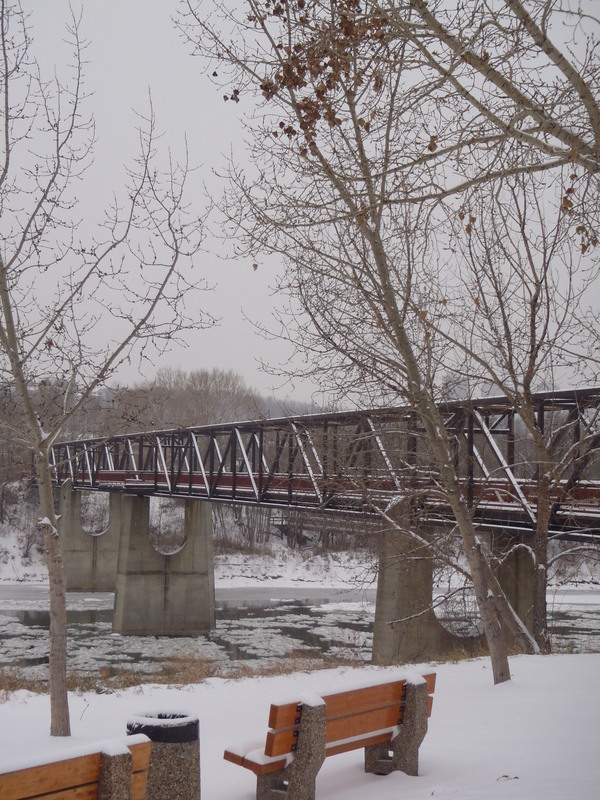 This is the pedestrian bridge that I cross twice each workday. Quite a while ago I promised Tootlepedal some pictures of our local bridges to compare to the lovely stone ones that often appear in his blog. Sorry for the delay. For good measure, here is another bridge picture with the added bonus of a bike. After a good (and very sound) night’s sleep my good humour was somewhat restored. 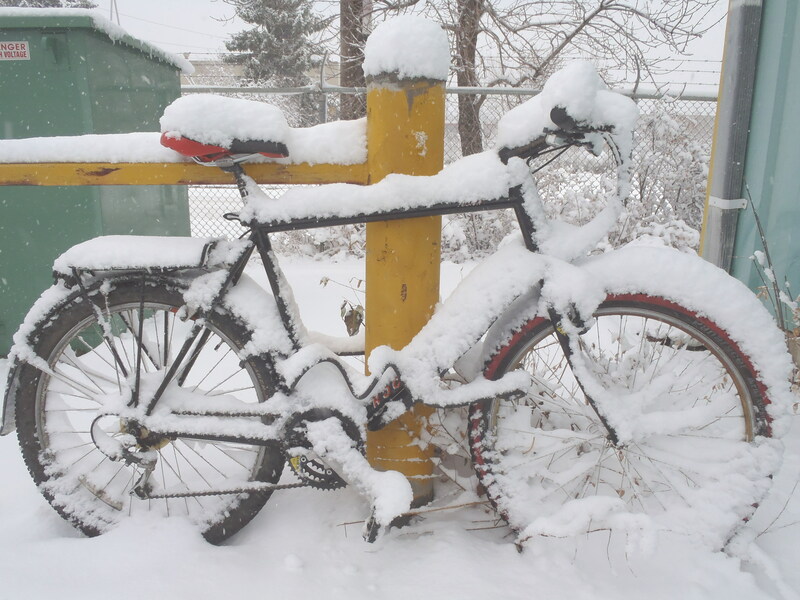 The snow was more firmly packed on the roads making for easier cycling and my body was remembering my winter bike handling skills. The memory of the months of effortlessly racing over bare asphalt on skinny-tired road bikes was receding. Winter had arrived and there was no use railing against it. This was my frame of mind when the second and bigger snowfall arrived less than a week after the first. 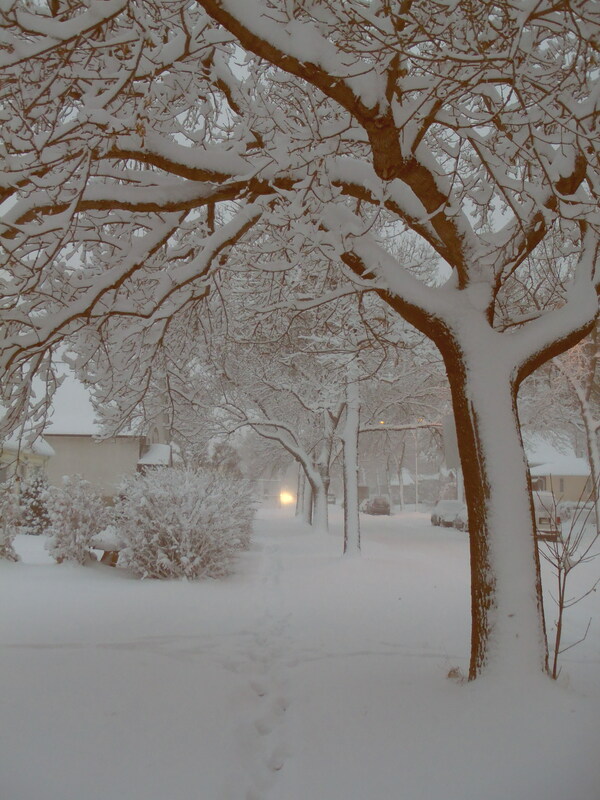 The snow was falling thickly as I headed to work in the morning, with the forecast calling for 10 to 15 cm. It was heavy and wet, clinging to my glasses and freezing in place. This time the ride was fun. The residential streets were largely untraveled and I enjoyed carving the first tracks through the snow. One other cyclists tracks were visible as I headed up Mill Creek. 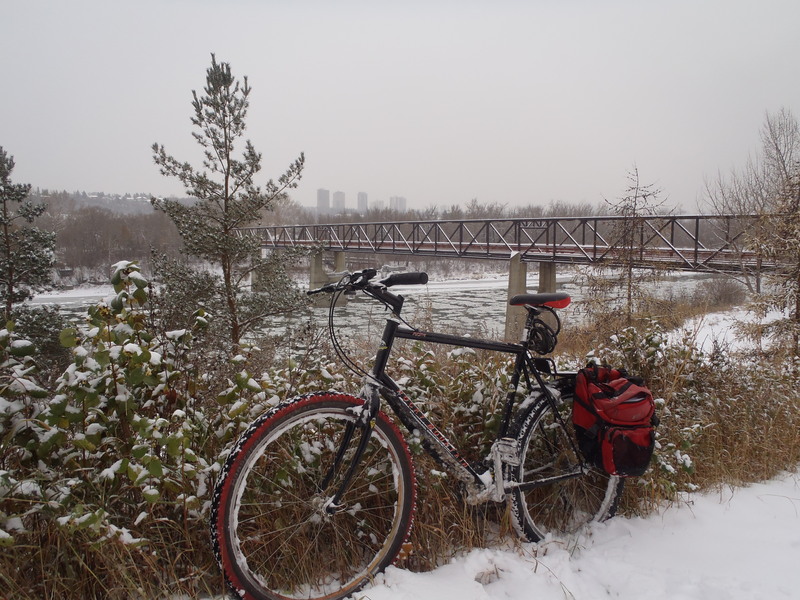 There were no other cycling travelers in the early morning winter wonderland. Once at work I locked my bike up and went inside. At lunch time I popped out to see how much snow had fallen. This was after 4 hours of snowfall. It would continue snowing for the rest of the day. Listening to the radio during the workday I heard an endless list of traffic accidents and disruptions. This was the kind of day on which Edmonton motorists are thankful for their 4-wheel drive vehicles or otherwise wish that they had one. I was looking forward to seeing how my one-wheel drive would manage the conditions. Our boss gave us the option of leaving an hour early in order to beat the rush hour and I gladly took advantage of this. Leaving early made a crucial difference to my ride home. The sidewalks were impassable but the snow on the roads was partly packed down by vehicles. Choosing my route carefully I was able to almost completely avoid sharing a lane with motor vehicles. The snow was difficult to move through but not impassable. After crossing Whyte Ave I decided to avoid traffic altogether and headed down into Mill Creek. This brought a quick halt to any progress by pedaling. The snow on the untracked portion of the trail was too deep and the parts traced down by pedestrians was not firmly packed enough to ride on. 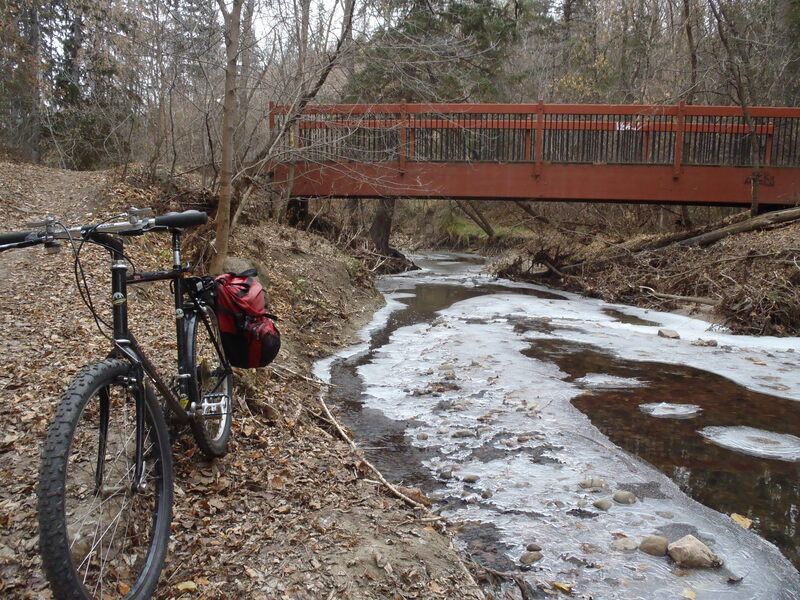 I ended up walking my bike through most of the creek and then across the bridge and backup to street level where I could ride again. That took at least half an hour. I met many pedestrians on my way through the ravine who were out enjoying the transformed landscape. Everybody was cheerful and pleasant and so was I, a marked contrast to my spirits during the previous week snowfall. Arriving at home I paused to take a few pictures in the rapidly dimming sunlight and then shoveled the walk. I was feeling good about my regained enthusiasm for winter cycling. The season may have arrived earlier than but I think now I’m ready to face it again. I may not have been able to manage my 100 mile ride but I’m already planning on some long winter rides. Maybe a winter metric century? Arriving home at the end of the day. Click to enlarge. It may be time to put my daughter’s bike back in the garage.